Following Nebraska's lead, 16 states are considering bills that would ban abortion at 20 weeks, because that's when a fetus can feel pain. The problem? There actually is no scientific consensus on when a fetus can experience pain. Last year, Britain's Royal College of Obstetricians and Gynecologists found that nerve endings aren't developed enough before 24 weeks to signal any pain. A fetus may have reflex responses, but since the nerves aren't connected to the cortex yet, there's no sensation of pain. The American College of Obstetricians and Gynecologists supports this research, stating that "no legitimate scientific information that supports the statement that a fetus experiences pain." Yet there's plenty of illegitimate scientific information on the topic. According to Reuters, many pro-lifers look to the research of Kanwalijeet J.S. Anand, a professor of pediatrics, anesthesiology, anatomy and neurobiology at the University of Tennessee Health Science Center. He says pain perception gradually increases in the fetus, and he thinks 20 weeks is a "safe bet" for when this begins. Only 1.5% of abortions take place after 21 weeks, but Republican legislators have gone out of their way to make things more difficult even for women who develop serious complications. Danielle Deaver of Nebraska told Reuters that 22 weeks into her second pregnancy, she lost most of her amniotic fluid and was told her baby would die outside of the womb with undeveloped lungs or be slowly crushed in the uterus. She asked to be induced to get things over with quickly, but this would have violated the state's abortion law. Instead she had to wait at home for 10 days until she went into labor. The baby died 15 minutes after it was born. While the proposed laws, which were promoted by the National Right to Life Committee, make exceptions for when a mother's life is in danger, there's no stipulation for serious but non-life threatening problems that occur during pregnancy. After hearing about Deaver's situation, Iowa State Rep. Mary Ann Hanusa, who supported a ban on abortions at 20-weeks that passed the House last week, said that labor shouldn't have been induced, even though her vote suggests she thinks the baby suffered for an additional 10 days. "We do not allow euthanasia of someone who may be dying or is infirm simply to allow them to die sooner," said Hanusa. Iowa Sate Rep. Sharon Steckman, who opposed the bill, complained that pregnant women will only be given an exception if they are "pretty much at death's door." 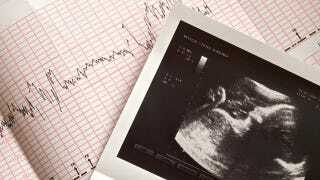 Mary Spaulding Balch, the Right to Life Committee's director of the department of state legislation, claims the group, "Would welcome a challenge to the pain-capable unborn child act," and says she believes the laws would hold up even in the Supreme Court. Of course, science has already challenged the Committee's claims about fetal pain, but the group is mainly interested in restricting abortion rights, even if it pointlessly increases the suffering of pregnant women.